This handmade paper from India is a product of a select group of "cottage industry" papermakers from the southern region of the country. The industry is still somewhat of a primitive craft with a slow 21st century movement to improving production facilities and equipment. This smooth hemp paper has been used for a variety of mediums and special applications. It has become very popular as text pages for hand-sewn leather bound travel journals. Because it is internally and externally sized India Hemp handles wet media and pen & ink extremely well. 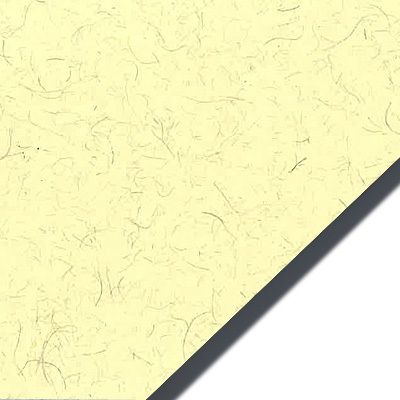 Visually, the sheet is a cream color with a mix of small colored fibers spread throughout the surface. The paper is naturally deckled on all four sides however each sheet can be a bit different with relation to size, shade, and deckle edge uniformity - this is typical and expected of all handmade papers produced in India.